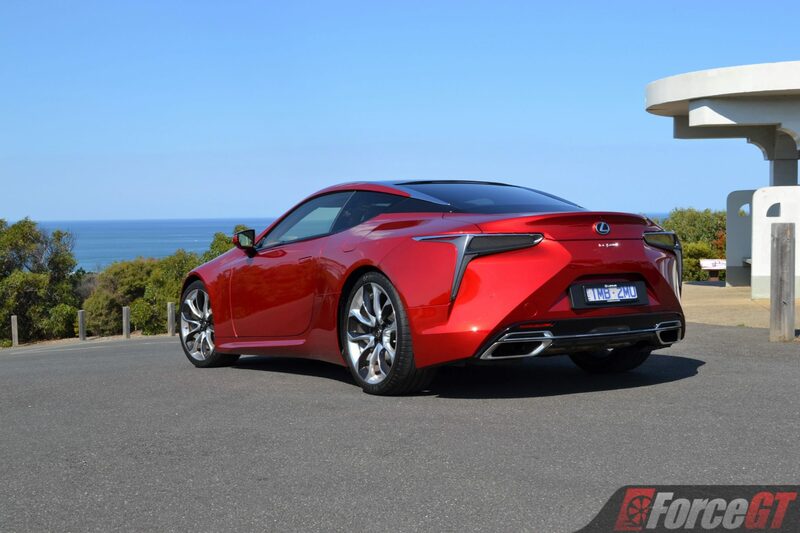 Home / Car Reviews / 2019 Lexus LC 500 Review – the best Grand Coupe under $200k? 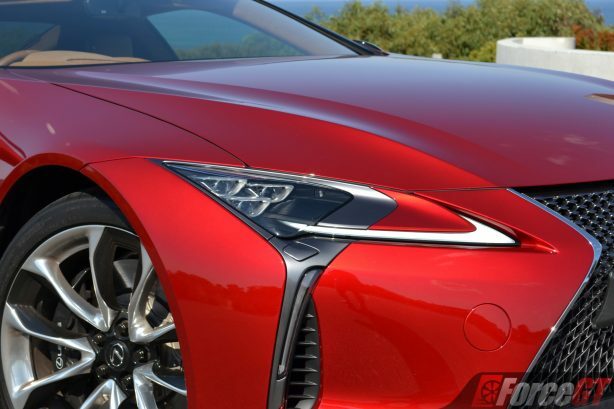 Sitting at the summit of their line-up, Lexus’s LC 500 has one tough act to follow and a lot riding on its shoulders. 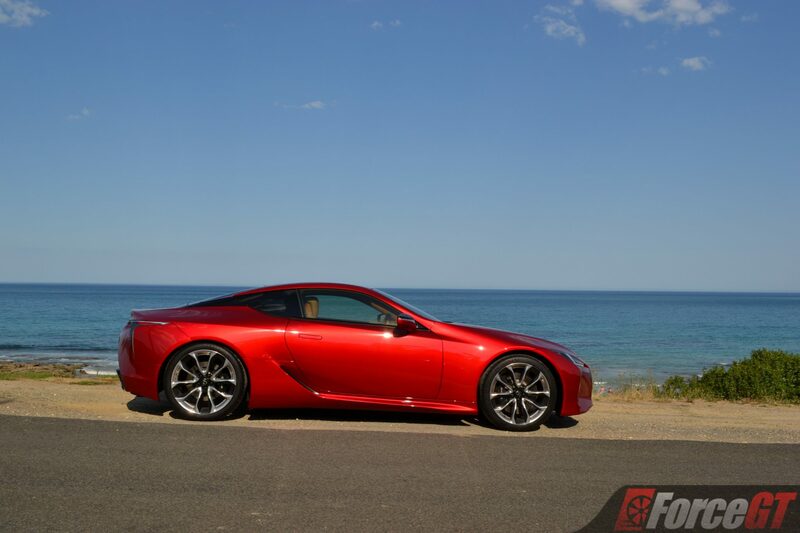 The LFA put Lexus on the map in the performance world delivering true supercar performance with no cost spared. 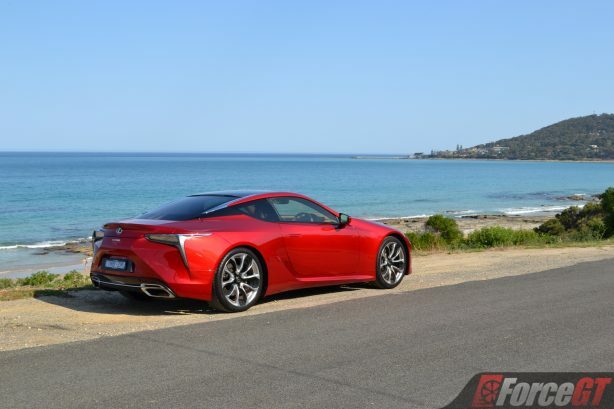 For the LC 500 they’ve taken a fresh approach, the performance has been wound down in favour of elevating both the luxury and style to higher levels while still managing to borrow a few tricks from the LFA. 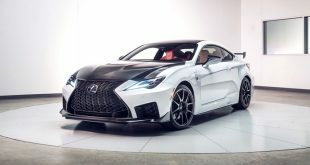 You get the feeling that the Lexus designers swing for the fence when it comes to styling a new car, sometimes it’s a swing and a miss, other times they knock it out of the park, and I can comfortably say, the LC 500 is safely in home run territory. From every angle the visual design elements work together to draw you in, a collection of smooth flowing lines and sharp angular highlights culminate in a package that draws attention wherever it goes. 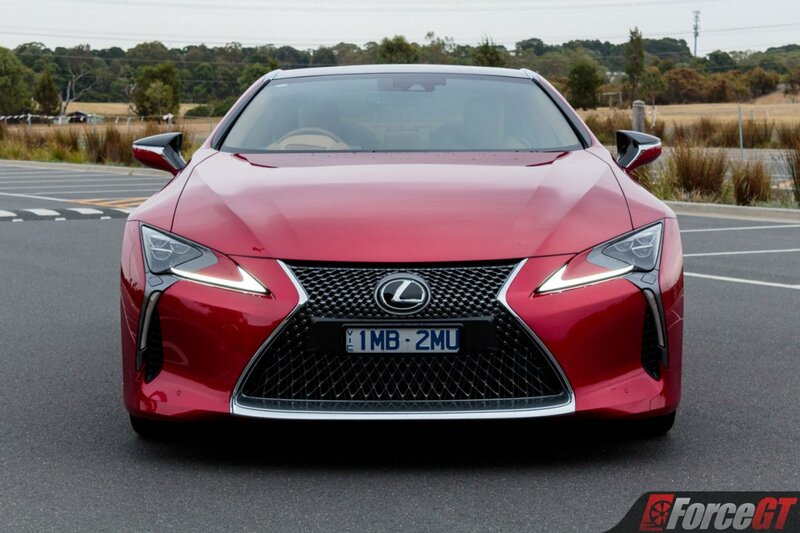 As you get closer the smaller details become apparent, the infinity display rear tail lights, the array of combined Lexus logos creating the inner headlight texture and the clever flush door handles. It’s a car that can be appreciated from a distance and even more so close up. 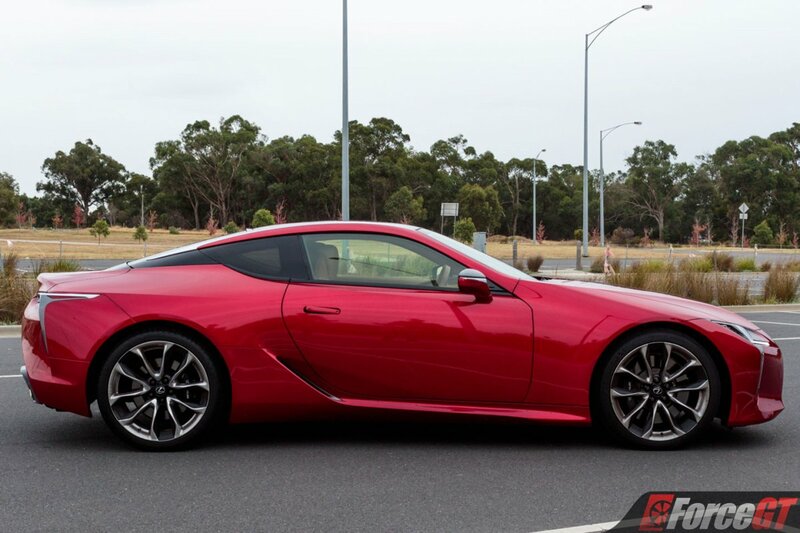 Out on the road the LC 500 becomes the center of attention no matter the environment and the classic two door coupe style carries itself with presence thanks to the 21-inch forged alloy wheels and pumped guards designed to house them. 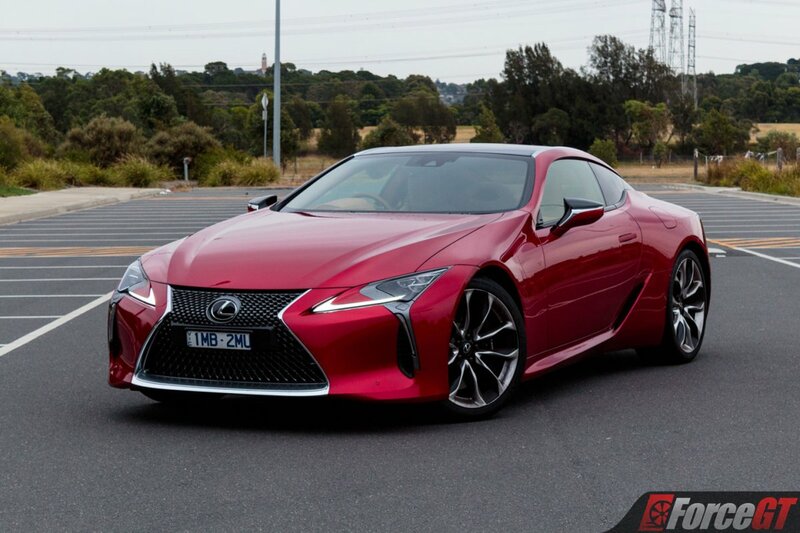 Impressively, the LC 500 is a brand new design that does not rely on rehashing the past or imitation for good looks. It’s able to carve its own styling path. 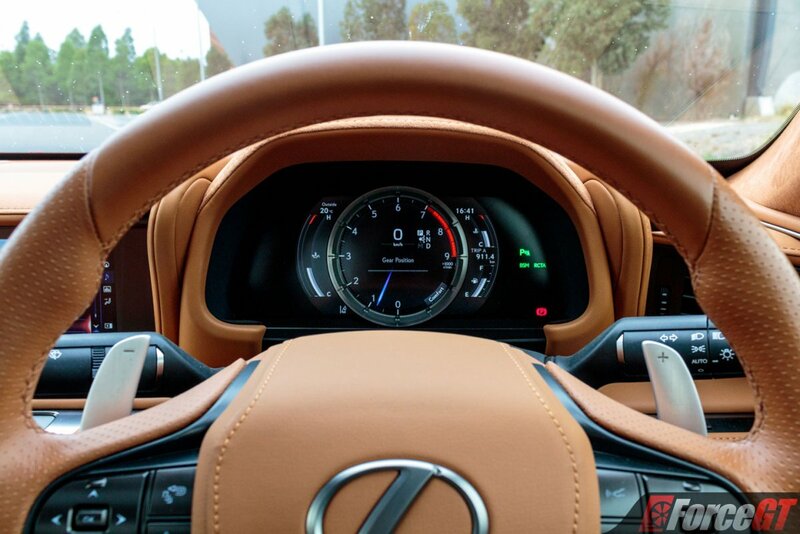 The L in LC 500 stands for Luxury and it’s the interior that drives this point home instantly. 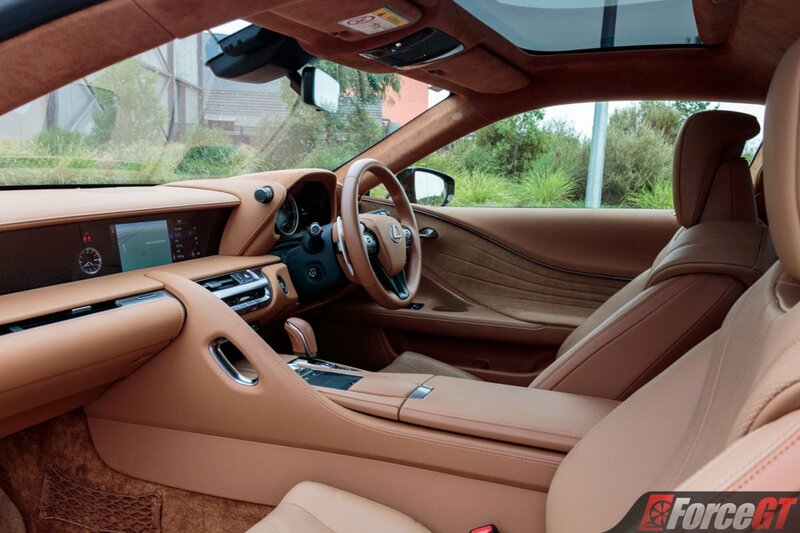 Material selection is top notch with twin stitched leather complimented by Alcantara, brushed aluminium and extra plush carpets, all pieced together with Lexus precision. 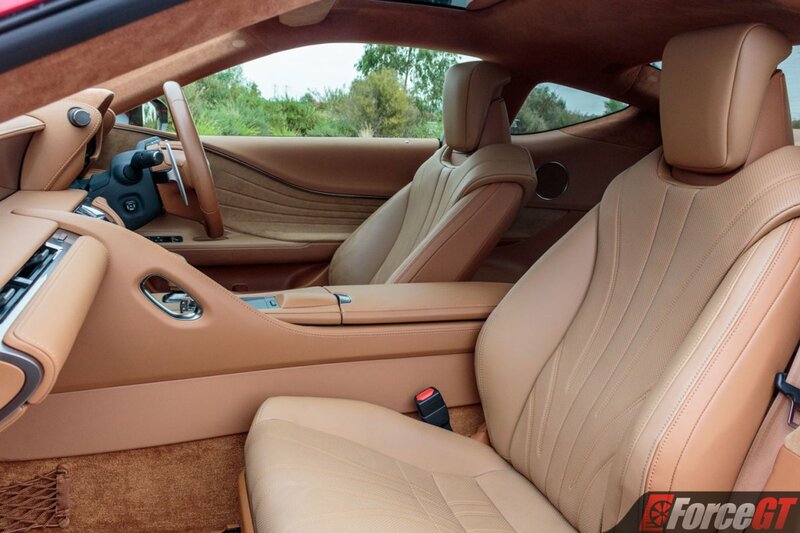 You can have it finished in the usual black and grey however it’s the tan styled Ochre option that refreshingly has the LC 500 stand out from the crowd with bundles of character and charm. 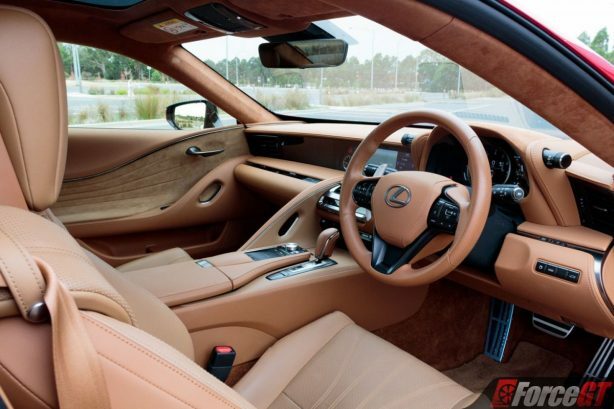 The end result is an interior that more expensive European brands struggle to match as their interior R&D budgets are no where near that of Lexus. This huge budget allows for development to be focused on all aspects of the interior down to the smallest detail. Tactile feedback from the switchgear is satisfying, the ergonomics are bang on and the overall visual design combined with excellent material choices make every journey a joy before it’s even started. 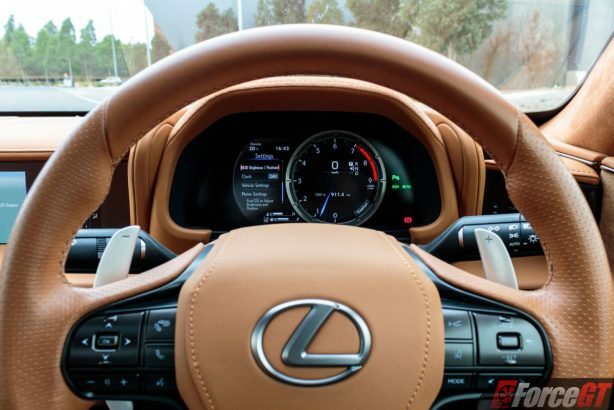 Lifted straight out of the LFA, the LC 500 scores the same instrument cluster which is a hybrid design incorporating several screens and a physical gauge housing. The tachometer is front and center flanked by twin displays showing the essentials, however with the touch of a button the entire gauge slides over to the right uncovering the menu system to the left. Driving modes can be adjusted with the dedicated stalk mounted to the left of the instrument cluster, with each mode having its own unique tachometer design. As nice as the interior is I was able to unearth some areas that could be further refined. 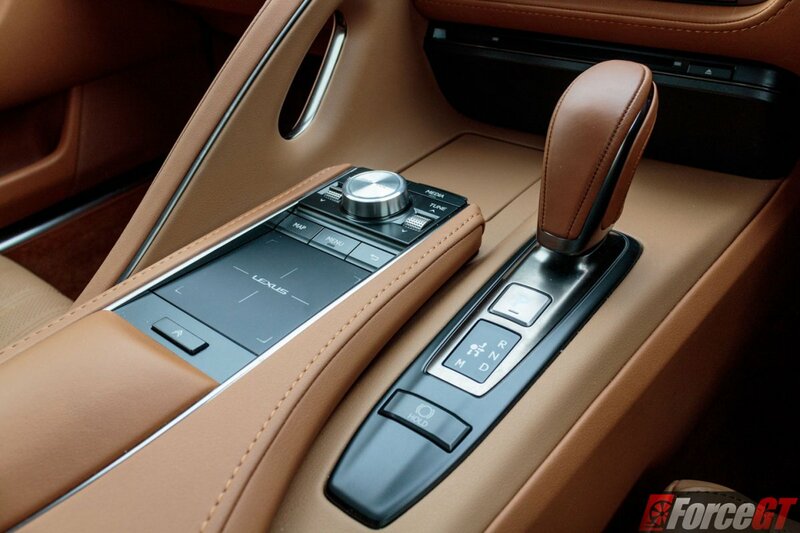 Most notable would be the center console which opens up in a two part process – sliding back first and then hinging open facing the driver to allow full access. It’s not the easiest for passengers to use and seems one step too complicated for no benefit other than the cool sliding motion. It’s also the only real place to put your phone unless you’re willing to make use of the single cup holder up front. Naturally the perforated leather seats are both heated and vented and when set to automatic mode they’re fine, it’s only when you want to make adjustments that things become overly complicated, as there’s no physical controls in the cabin. 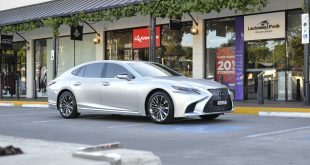 You’ve got to use the Lexus Remote Touch system to dive into a sub-menu where they can finally be adjusted which is far too many steps when a simple set of switches or dials would suffice and give you the opportunity for more tactile engagement. 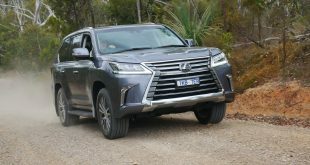 Compared to the previous incarnation as detailed in our RX 450h L review, the touchpad based system is an improvement yet still lacks the intuitiveness of a rotary dial interface as it requires you divert attention away from the road to simply navigate the menu system. This design allows for a more flexible menu system which works against it since it requires more attention to operate than traditional methods. To make things easier the pad provides vibration feedback as you move the cursor about but it’s far from ideal. 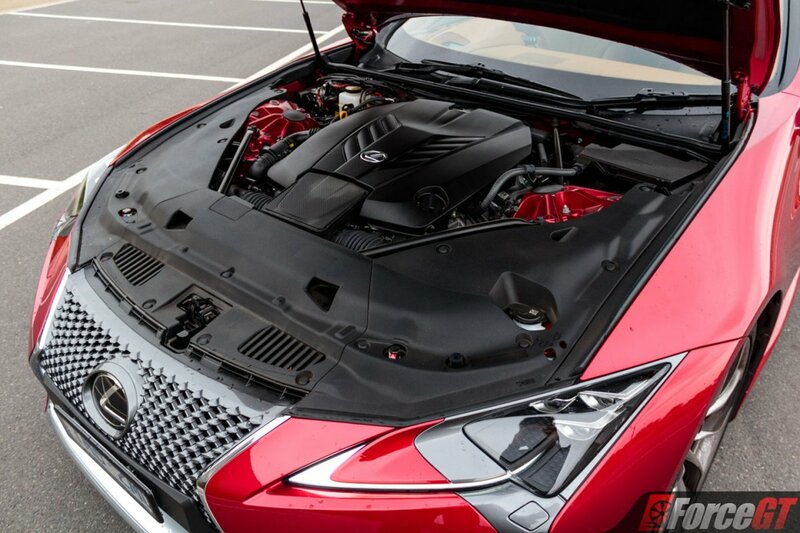 There’s 5.0 litres of high revving V8 muscle living in the engine bay and the LC 500 isn’t shy about letting you know it’s there. 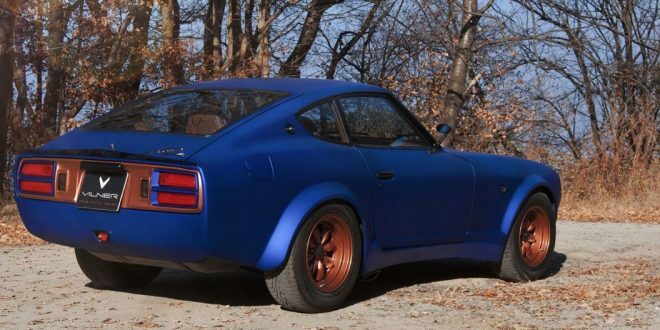 The exhaust note is addictive and will have you wanting to bury your right foot at every opportunity to let it punch out the clean and throaty tune. 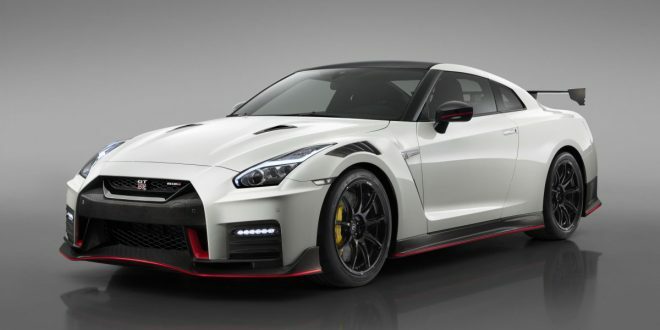 It’ll roar all the way to its 7300rpm redline with the power climbing the entire time never dropping off. A total of 351kW is at your disposal which is good for a 0-100km/h time of 4.7 seconds. 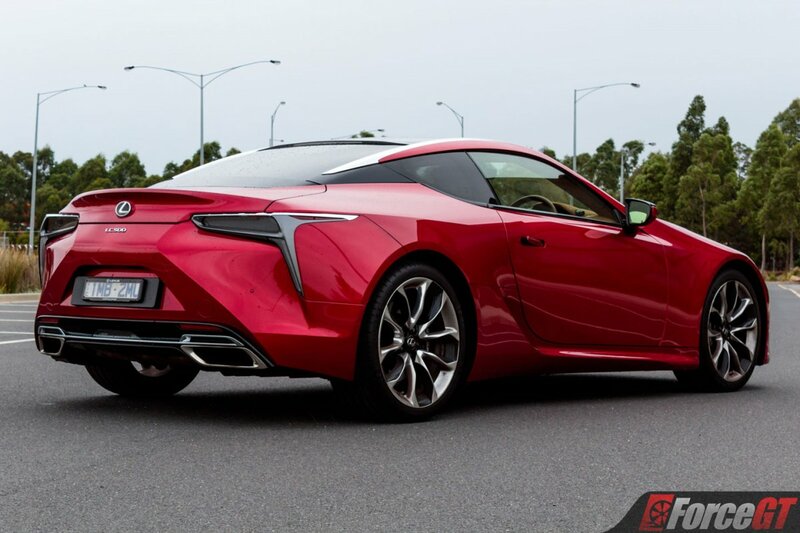 Big V8 means big torque, 540Nm of it in total that peaks at a fairly high 4800rpm. It’s the engine that gives the LC 500 so much of its character, exhaust blips on the down shift and the grumbly burble at low speeds make it a crucial part of the driving experience. 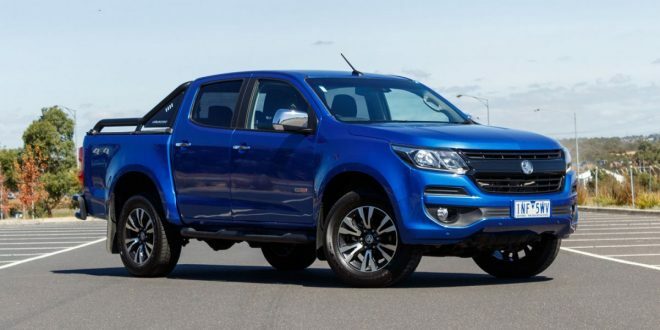 Getting every bit of power to the ground is the job of the 10-speed automatic gearbox which matches excellent ratios and rapid shifts with the durability and smoothness that automatics are renown for. 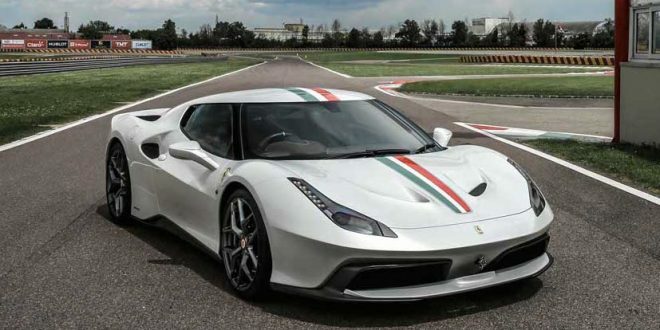 Gear shifts aren’t as lightning quick a those found in dual clutch transmissions but they’re not far off and the minuscule hesitation between them heightens the driving experience. You also don’t get the associated downsides of a dual clutch such maintenance costs, rough starts and overall fragility. With Sport mode selected the throttle is as sharp and crisp as your right foot can provide and the gearbox will take every opportunity to downshift and get those revs climbing. 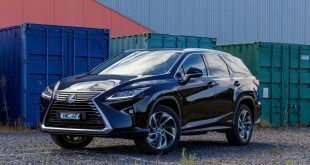 The engineers at Lexus have put together a traction control system that does its best in getting power to the ground while making sure that momentary lapses in traction add to rather than hinder the experience. 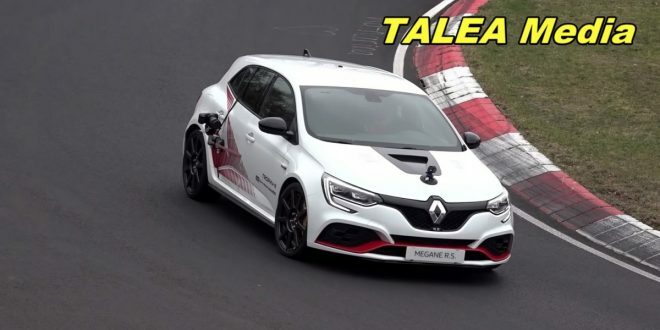 Comfort and Eco mode still offer the same power just in a more relaxed manner, downshifts are lazier and the throttle inputs are smoothed out. 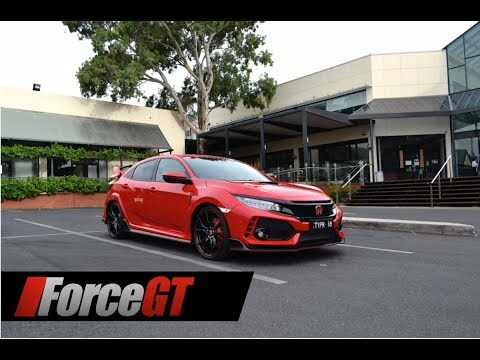 The ride is also toned down, bumps are ironed out and you’re more insulated from the road, that said Sport mode is still a viable option for daily driving leaving Sport+ only for situations that merit spirited driving. Lexus has done an impressive job on the fuel economy front given that the LC 500 weighs in at a hefty 1935kg, that’s a lot for a two door coupe. 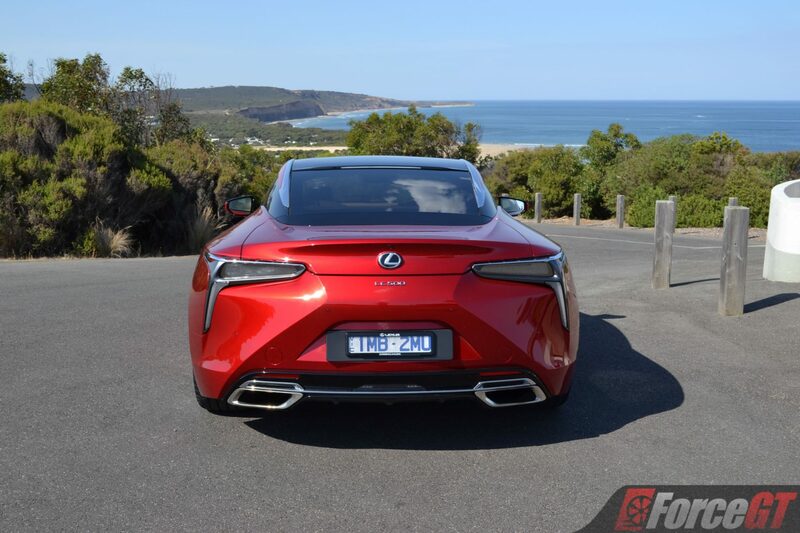 The official figures claim that 11.6L/100km is possible and I’ve no doubt that’s bang on the money. With more freeway driving than usual I managed to etch out a respectable 11.1L/100km which included plenty opportunities to plant that right foot. 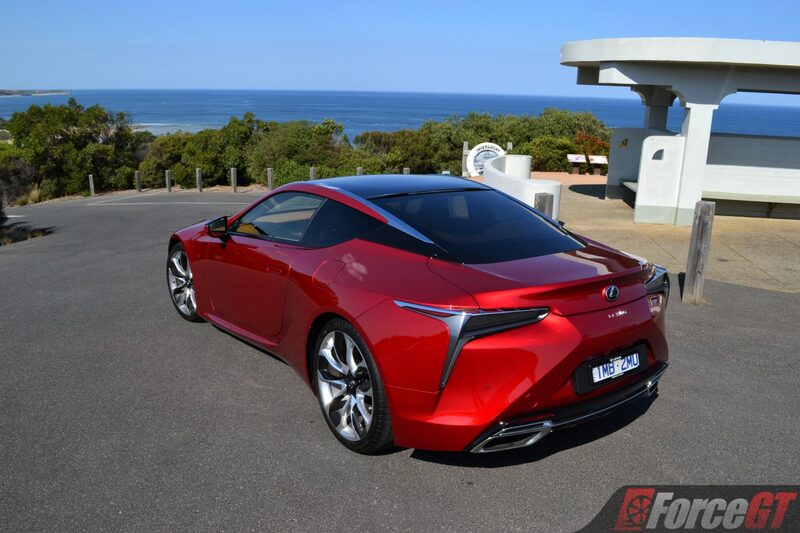 When the opportunity presents itself and you decide to shred those fuel economy figures to bits it’s good to know that the LC 500 has it where it counts in the handling department. 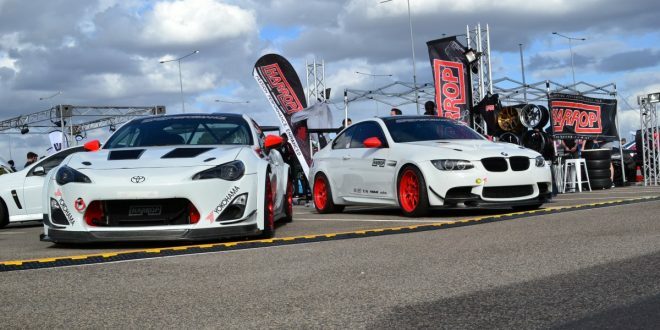 There’s generous amounts of grip both front and rear, the neutral handling profile is reinforced by the firm suspension setup that assists by shifting the weight quickly on corner entry. 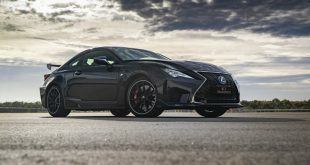 There’s no getting around the laws of physics which is why the near two tonnes of Lexus is best driven in a manner befitting of a grand tourer rather than a Nurburgring tuned track monster. 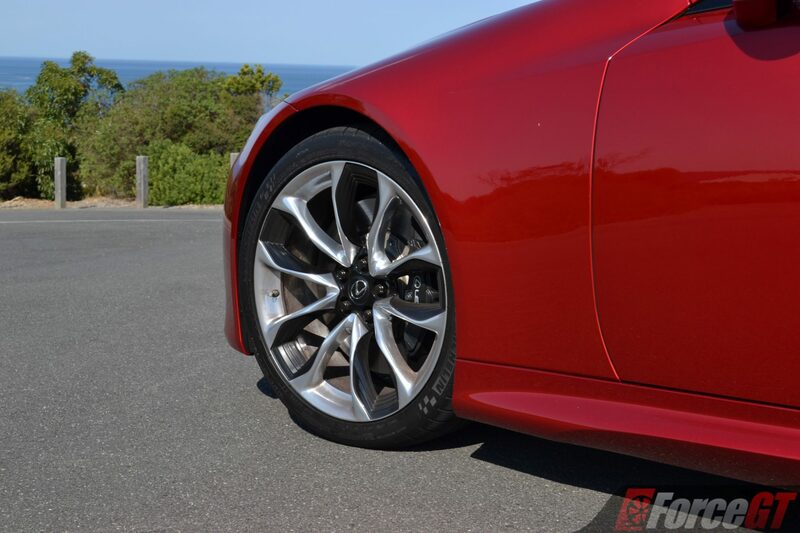 With 6 pot calipers up front and 4 pot calipers in the rear the braking performance is precise, predictable and dependable. Pedal feedback is direct and provides all the necessary information to get the most out of the brakes when being pushed. 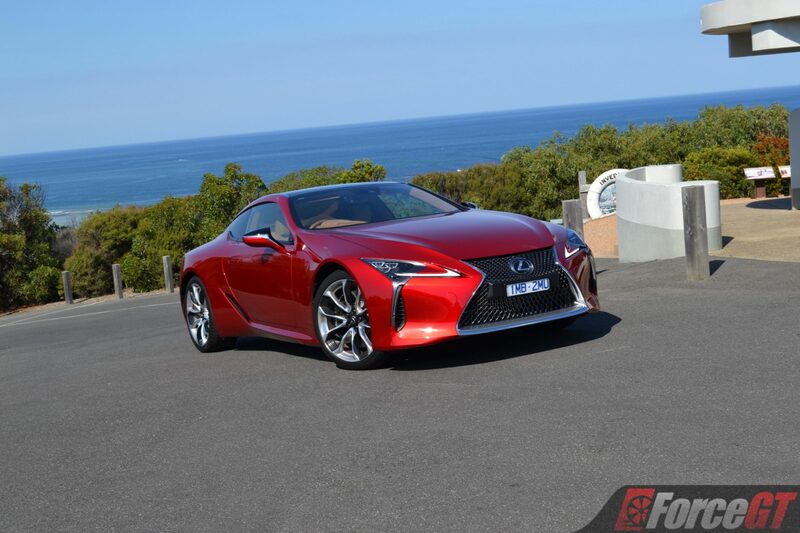 Lexus is not holding back when flexing their muscles in the tech department and as the LC 500 is their current performance flagship you can expect a solid load of features to be included. 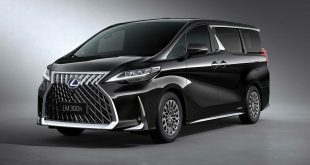 First up there’s the adaptive matrix headlights that scan for other cars adjusting their output to always provide the maximum visibility without blinding other drivers. 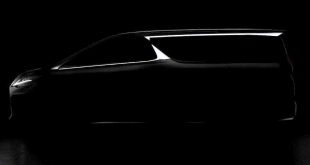 It’s like a more sophisticated automatic high beam system which rather than flicking all the lights down to low beams when a light source is detected, only the individual lights that are directed at that source get turned off leaving the rest to continue lighting the way. 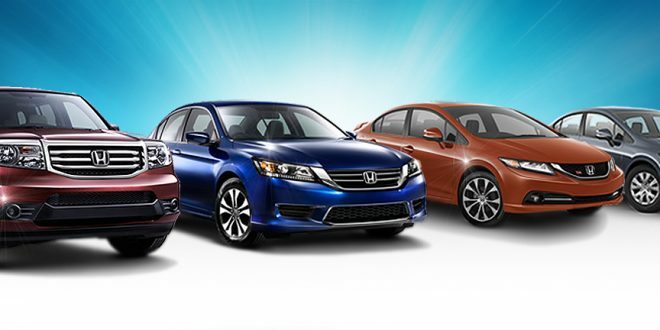 The usual assortment of safety tech is included such as lane keep assist, blind spot monitoring and rear cross traffic alert however you also score the advanced Pre-Collission Safety System that uses input from the radar and camera systems to detect potential collisions and take action. The first stage of detection will warn you through audible beeps, an instrument display warning and also pre-arming the brakes while the second stage will override the braking system to avert impact. 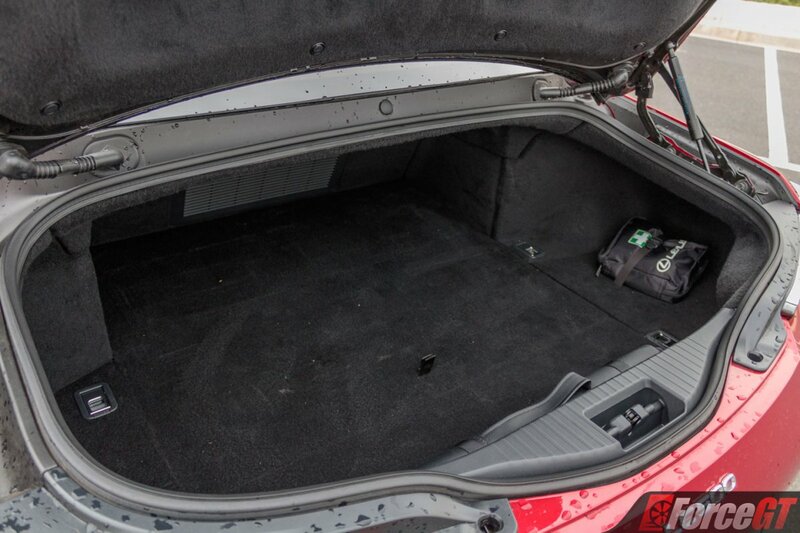 Safety technology is great to have and even though there’s explosives built into the pedestrian dampening bonnet, it’s just not all that exciting. What will excite you on a more day to day basis is the 13-speaker 918 watt Mark Levinson surround sound system. It’s easily the best car audio system I’ve had the pleasure of listening to. Audio comes through cleaner, crisper and all improved by the surround sound qualities of the system. The experience is further enhanced by the impressive insulation from the outside world that the cabin provides. There are a few items missing from the tech lineup that would really benefit the LC 500. First up is speed limited cruise control, yes you do get radar cruise control which is great for freeway driving just not around town. That’s where speed limited cruise control really shines as you can just set it to the upper speed limit and put your speed ticket fears to rest. Further to that, speed sign recognition is also unavailable which again is a great piece of tech that’s extremely useful in today’s over regulated world. 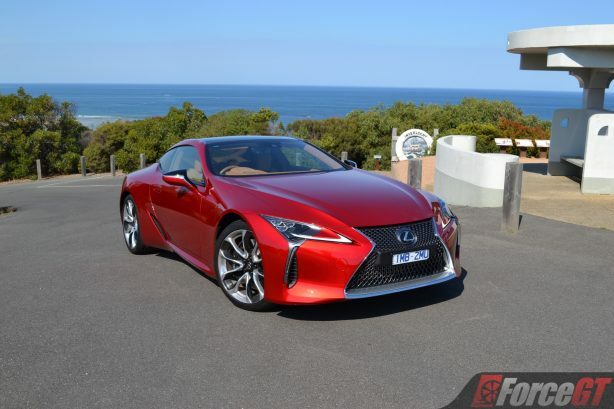 Also missing is any form of Android Auto or Apple CarPlay which is no surprise as Lexus has been lacking in this department for a while only recently offering Apple CarPlay as an option in some models. 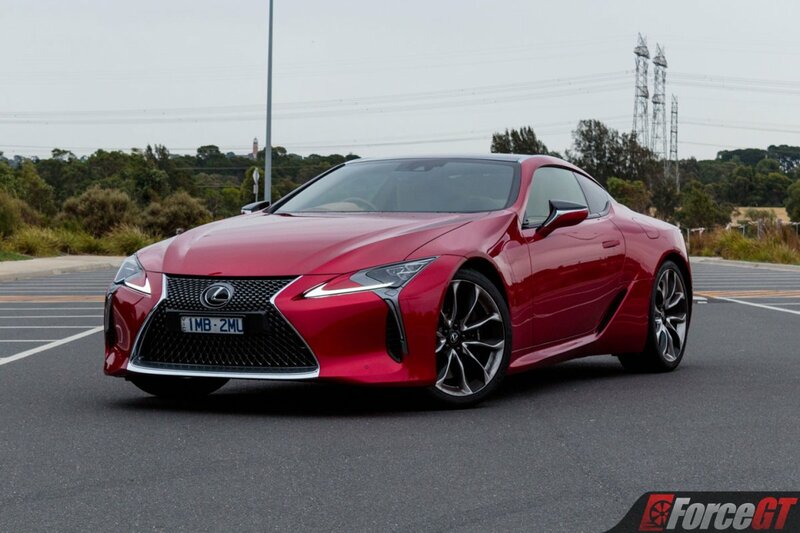 The Lexus LC 500 is the type of machine that caters to drivers who know what they want – an abundance of style matched with luxurious comfort. 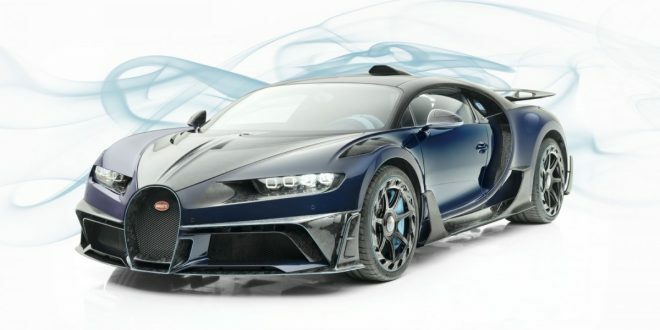 Speed and power are naturally part of the package but not the primary focus as that would be a detriment to its clearly defined purpose, which it fulfills effortlessly. Safety 8 Airbags, Seatbelt Load Limiters (front) & Pre-Tensioners (front/rear), Reverse Camera, Hill Holder, Blind Spot Monitoring, Forward Collision Mitigation, Forward Collision Warning, Pedestrian Avoidance Control, Bonnet Active Safety, Brake Emergency Display, Electronic Damper Control, Electronic Stability Control, Park Distance Control (front/rear), Lane Departure Warning, Lane Keep Assist, Tyre Pressure Sensors, Anti-Lock Braking System, Brake Assist, Traction Control, Stability Control, Electronic Brake Force Distribution.